This was the view awaiting the homeowners each time they pulled into the driveway. It was a blank canvas for a landscape designer. ​Brick paths were laid, dwarf crab apple trees were planted, lots of boxwood were delivered and the beginning of a very special garden took shape. 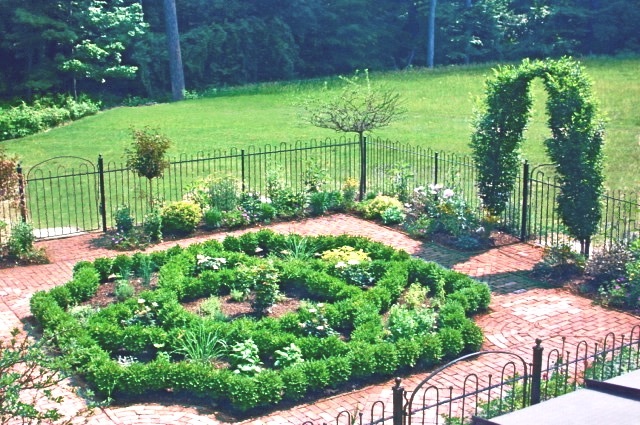 A plan gave birth to a formal knot garden. 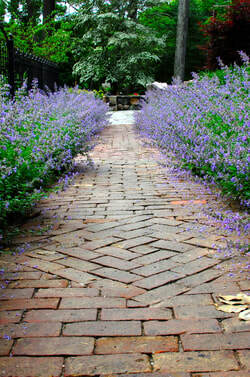 Herbs are planted within the knot, while colorful perennials grow with wild abandon around the perimeter. Upright hornbeam trees are encouraged to grow into an arch over one of the gated entries.